Teiid Embedded is a light-weight version of Teiid, it contain an easy-to-use JDBC Driver and an embed Query Engine. The Embedded mode supply almost all Teiid features without JEE Container involved, it supply a convenient way for Users who want integrate Teiid with their Application. 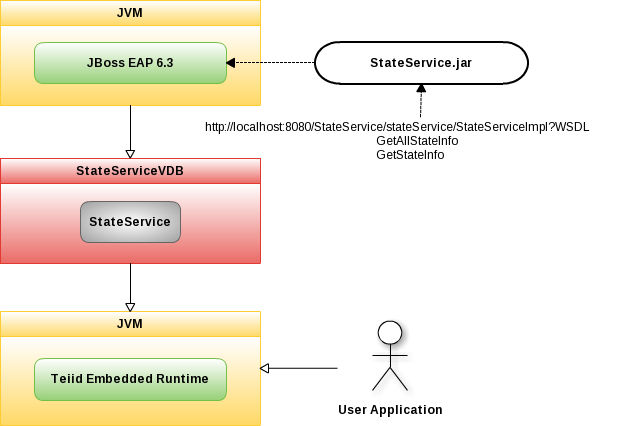 JBoss EAP 6.3 hold the StateService.jar run on JVM, it supply State WebService for users to extract all states information, or extract only one state information via stateCode(for example, state code CA will get California information). Note that: In this example, JBoss EAP 6.3 run on localhost. Web Service StateService Example have detailed steps for deploy StateService.jar and StateService. A Virtual Database (VDB) is an artifact that defines the logical schema model combining one or more physical data sources to provide easy data integration. In this example, StateService VDB has Model StateService point to Web Service run on JBoss Server.